TQL readers around the globe were fascinated by the silk sampler in Laura Fisher’s column “For All It’s Worth” (June 2011). “It reminds me a little of a crazy Dear Jane,” wrote Linda Lesiak of Fullerton, Nebraska. 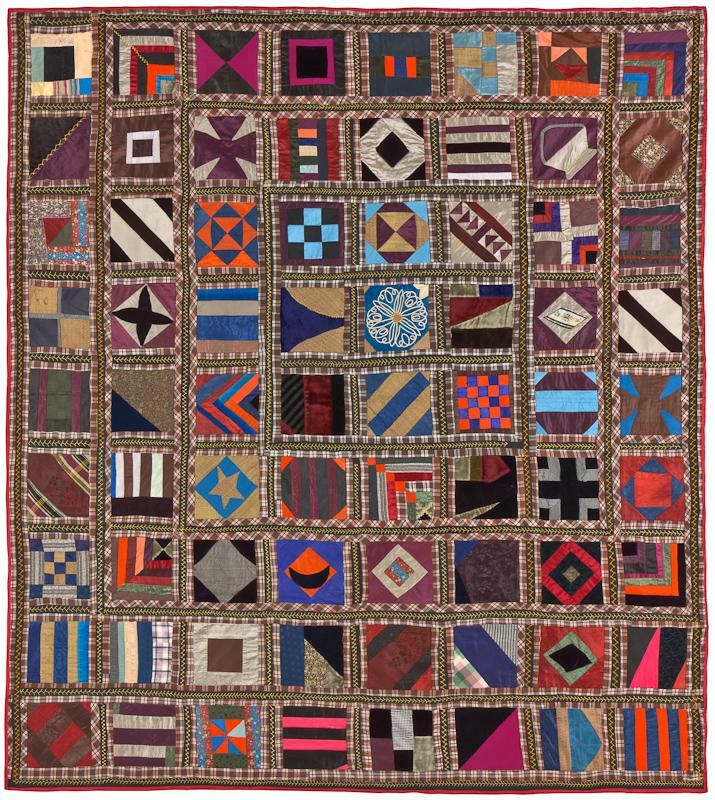 Jodie Storm, of Bonville, NSW, Australia, cheerfully confesses to being obsessed with historic quilts. She’s given lots of thought to this one, and suspects this stunning quilt was made by an inexperienced quilter, perhaps a teenager, who made it up as she went along. Jodie told Laura how she figured out the way the quilt was constructed. “I labeled the vertical rows A-H, and the horizontal rows 1-9.The quiltmaker initially made three rows of three blocks each, D3-F3, D4-F4 and D5-F5. 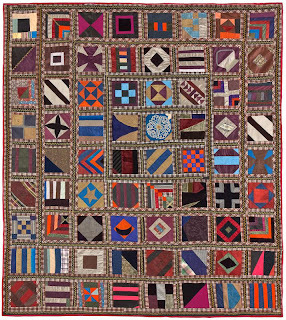 Block E5 was created as the center focal point of the original quilt. The quilter then added rows to all the sides, and then another set of rows. See the way the black embroidered sashing turns the corners around each of the block sets? And of the sometimes bias cut and sometimes straight cut plaid sashing strips? Also note the Log Cabin “corner” chevrons (Blocks B1, H1, B7 and H7) are very similar in form, with the inside corners facing the center of the quilt. They would have been the corner blocks of the original top. At a later date, she added rows A1- A7, and A8 – H8. The plaid sashing has again become straight ̶ unlike the bias cut of the original top, and there are several silk checks and plaids which do not appear in the original center. Thanks for taking the time to share this with us, Jodie. Maybe you are a little obsessed. But aren’t we all? It’s the way it is when you live the quilt life. very user friendly. I’m an 79 year old quilter, been at it a long, long time. Always something new to learn.